DIMENSIONAL WEIGHT AND FREIGHT CLASS IN RESPECT OF U.S. GROUND TRANSPORTATION VS. INTERNATIONAL SHIPPING OF LCL OCEAN FREIGHT. LINE HAULS & PICKUPS. If you self-deliver your boxed, crated or palletized goods directly to INTERNATIONAL OCEAN FREIGHT CARRIER'S TERMINAL (In LCL ocean freight named CFS. Container Freight Station), then weight of your cargo most likely will NOT be a pricing factor* in your international shipping. I.e. shipping ocean freight self-delivered to Ocean Freight Carrier’s terminal should be most cost-effective way in international shipping using LCL service. However, if you request a PICK UP (collection) your packed goods from "your door" OR self-deliver it to a local LTL DOMESTIC CARRIER'S WAREHOUSE (but not directly to an international ocean freight carrier’s CFS) for the haulage (trans-shipment) of your cargo to an international ocean freight carrier’s CFS, then shipping cost for the domestic haulage (trans-shipment) will be based on DIMENSIONAL WEIGHT of your cargo. In this case you have to consider weight of your cargo a pricing factor in the international shipping. I.e. final shipping cost of your international shipping will reflect actual or dimensional weight of your cargo. A. International shipping terminals WITHOUT asterisks (Miami, FL for example) are direct international ocean carriers shipping terminals CFS. Container Freight Stations. (The Option A in our price quote to you). International shipping directly via CFSs should save you money on your international LCL ocean freight shipment. There will be no additional charges to your international LCL ocean freight to take your cargo on board of cargo vessel. Also, freight charges (chargeable volume per cubic meter) for LCL ocean freight shipments self-delivered directly to international ocean freight carrier's CFS are based on size of cargo only. WEIGHT FOR SUCH INTERNATIONAL OCEAN FREIGHT SHIPMENTS IS NOT A PRICING FACTOR unless its density does not exceed the limit nominated by ocean freight carrier. Note that density limit in international shipping using LCL ocean freight service is very high. Regular cargo most likely will not exceed the limit, which is most often equal to 1654 lbs (or 750 Kilograms) per Cubic Meter*. B. 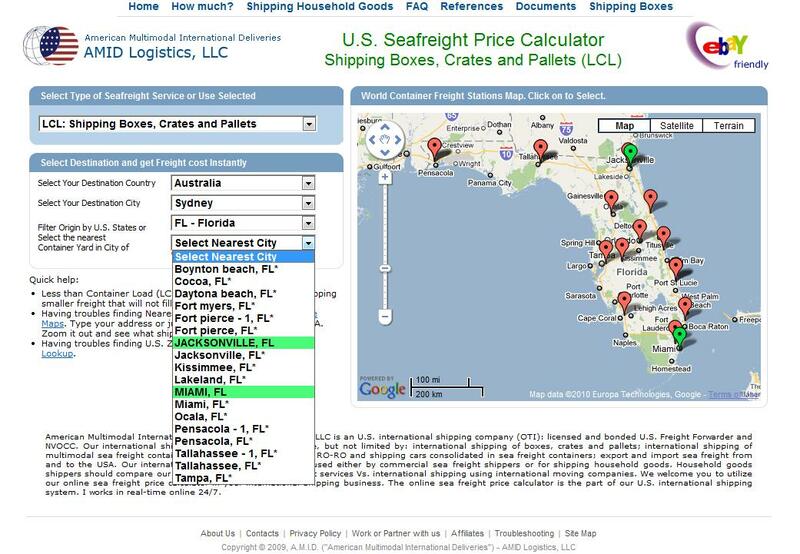 NOT international shipping terminals WITH asterisks (Cocoa, FL* for example) are local U.S. domestic LTL carriers shipping terminal. Cargo dropped off at such terminals requires being line hauled to an international ocean carrier's facility (CFS). International shipments initiated via such terminals, unlike shipping freight directly from CFSs, are subject to a line haul charge on top of international ocean freight. C. Finally, using our Online LCL Seafreight Price Calculator, you will be able to request to pick up your boxed goods from "your door". Then we will determine pickup charges by ZIP (postal) code of your goods location entered in our online international ocean freight shipping system and return to you our complete international shipping price quote, including a pickup option for your consideration. INTERNATIONAL SHIPPERS SHOULD BE AWARE THAT LOCAL U.S. LINE HAUL AND PICKUP CHARGES, INCLUDED IN TOTAL INTERNATIONAL SHIPPING COST OF YOUR OCEAN FREIGHT SHIPMENT ARE BASED ON DIMENSIONAL WEIGHT OF CARGO AND THE FREIGHT CLASS. DIMENSIONAL WEIGHT IN U.S. LTL GROUND TRANSPORTATION: Dimensional Weight (or Dim. Weight) states for volumetric standard instead of using actual weight. In respect of international shipping of LCL ocean freight, Dimensional Weight will be used by U.S. domestic LTL carriers in calculations of charges for inland pre-carriages of international ocean freight shipment to ocean freight carriers export facilities (CFSs). When you work with our online LCL ocean freight shipping system and request pickups or line-hauls, you enter dimensions and weight on each shipping unit. Then you will instantly recognize either you be charged by space or volume of your shipment. In other words, in international shipping of ocean freight, U.S. domestic pickup and/or line-haul charges are based either on Actual or Dimensional weight of cargo, whichever is greater. In general dimensional weight favors shippers of dense objects and penalizes those who ship lightweight boxes. For example: a box of un-popped corn kernels will likely be charged by gross weight; a box of popcorn will probably be charged by its dimensional weight. Shippers avoid dimensional weight charges by using smaller boxes, by compressing their goods, and by reducing the use of packing materials. Dimensional weight for U.S. domestic ground transportation calculates using this formula: Dim. Weight in LBS = L x W x H (in inches) :194. *INTERNATIONAL SHIPPING OF OCEAN FREIGHT: Since international shipping companies' vessel capacity is not really limited by weight of cargo but by the hold of the ship, then charges for regular international ocean freight shipments are based on the total cargo volume. In general, in international shipping using LCL ocean freight service, weight of cargo is not a pricing factor. However, in international shipping using LCL ocean freight service, there is a cargo density limit if WM ocean freight rates are present. It varies depending on international ocean freight carriers, origins and destinations, etc. Regular international ocean freight shipments most likely will not exceed the density limit. In general exporters and importers have to be aware of the 'U.S. 45 lbs rule in ocean freight': 45 lbs = 1 cubic foot. This means that if density of international LCL ocean freight shipment exceeds 45 lbs per one cubic foot, then chargeable shipping volume (total shipping cost) on the ocean freight will be calculated using this formula: Total Weight of ocean freight (in pounds) divided by 45 lbs = Chargeable Volume in cubic feet. FREIGHT CLASS IN U.S. LTL GROUND TRANSPORTATION: Freight Class is the category of your freight defined by the U.S. National Motor Freight Traffic Association. (NMFTA). It is also referred to as NMFC: National Motor Freight Classification. Freight Class of your shipment is determined by its contents, as different types of products have different shipping costs. There are 18 different freight classes from a class 55 up to a class 500. In our system freight class determines the rate you will pay on pickups or/and line-hauls of your goods to ocean carrier’s facilities (CFS – Container Freight Stations). Higher freight classes are subjects to higher costs on the ground cargo transportation. Our online ocean freight shipping system helps you to determine freight class based on the density – the one out of four characteristics. However, shipper must consider the rest of the characteristics and change freight class on his/her shipment if necessary. You may also call the NMFTA direct at (703) 838-1810 in order to reconfirm freight class on your shipment by commodity. FREIGHT CLASS IN INTERNATIONAL SHIPPING OF OCEAN FREIGHT: Freight Class, in respect of U.S. domestic ground transportation, does NOT apply to international shipments self-delivered directly to international ocean freight carrier's facilities named CFS – Container Freight Stations. Our system represents CFSs by listed cities WITHOUT asterisks (*) within origin-destinations cities dropdown lists (Miami, FL for example). IMPORTANT: SHIPPER IS HELD RESPONSIBLE ON FREIGHT CLASS DECLARATION. OUR PICKUP/LINE HAUL PRICE QUOTES ARE BASED ON THE FREIGHT CLASS DECLARED BY SHIPPER. DECLARATION OF INCORRECT FREIGHT CLASS MAY RESULT TO PRICE SCHEDULE CHANGE. Notice: If you declare household goods in your shipment then your freight class, regardless on its density, most likely will be reclassified by the carrier to the class 100 or even 150.